Well, this week it is becoming real. I am looking around at our wet fields feeling a bit uneasy about upcoming shares. I am noticing what is (not) blooming, what is (not) growing, what is (not) fruiting and realizing our fields look like it is the beginning of May. Yet, I am reminded why I chose this model of small farming. Equal risk. Focus on farming and not on marketing. Working with a budget upfront, knowing exactly who we are growing for, spending our time and energy focusing on recovery of our crop plan instead of flailing about to do a weekend farmers market. This moment is exactly what every farmer hopes never arrives. Record weather, unseasonable temperatures, misbehaving crops thinking it is already fall. 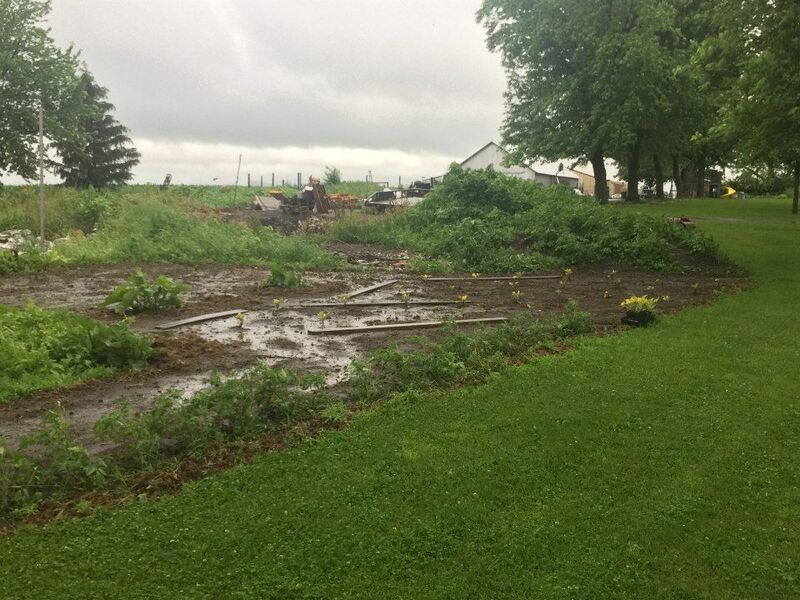 Excessive rain and standing water presents a new feat of managing soil erosion in our fields. Another concern is taking even one step onto the planted beds, choking the roots of seedlings when compacted soil hardens like concrete when (IF!!) the sun comes out. Unlike neighbors around me who are in crisis, I feel blessed to have a model of producing food where my bottom line is determined before I ever start planting when members sign up a season ahead of time. And even though we are ramping up to having a viable budget and full membership, we are mostly making ends meet in just our second year of producing as a CSA farm. I share this with you to remind you that even though our shares may seem a bit sparse over the next three weeks, we get to spend week 7 though 10 focusing on production for the second half of the 22 week season. These next three weeks will be operating in recoup mode: seeding quick growing spinach and lettuce, planting a share and a half portions for fall crops like cauliflower, broccoli and daikon root, nurturing tomato, eggplant, peppers and squash plants that have endured this excessive rain. This is the blessing of a working CSA model to grow your food. Even though I do have spurts of dismay and disappointment, I remind myself that this is the ‘endure the risk’ together portion of a CSA agreement. That I get to interrupt outside scolding and uneducated critics and remind us all that we are in this together. In black and white from the get go. We are enduring this perceived crisis together. And I am doing it in high spirits and faith in God and Mother Earth to replenish our plates in a quick fashion as we set in to gear up for the second half of 2015 growing season. With faith in each of you to withstand lots of kale and onions while we await the bounty of warmer, drier days. Thank you to all who continually show up to volunteer and especially to my family who are spending their days off assisting with all things garden and field. Thank you to my mentors and fellow learners who are showing me how to prevail beyond expectations in times like these.